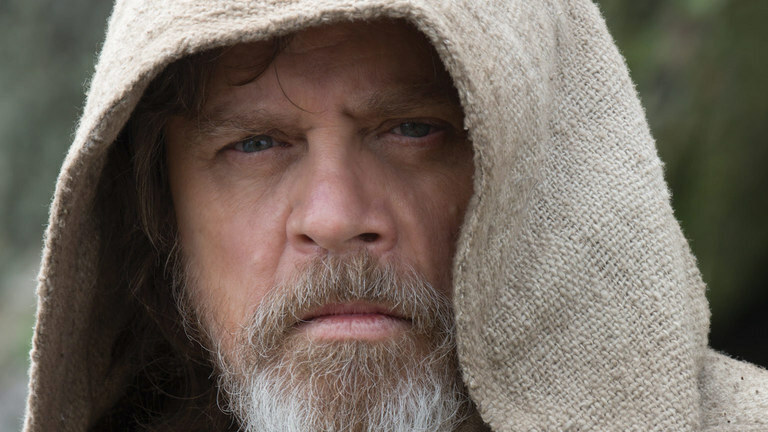 It’s been over 30 years since we’ve seen Luke on the big screen. In honor of Star Wars: The Last Jedi, we’re critiquing the resume of one of cinema’s most iconic characters and providing you with valuable resume writing tips. Without some help, this document might end up thrown in the trash compactor by that administrative assistant back on Coruscant. 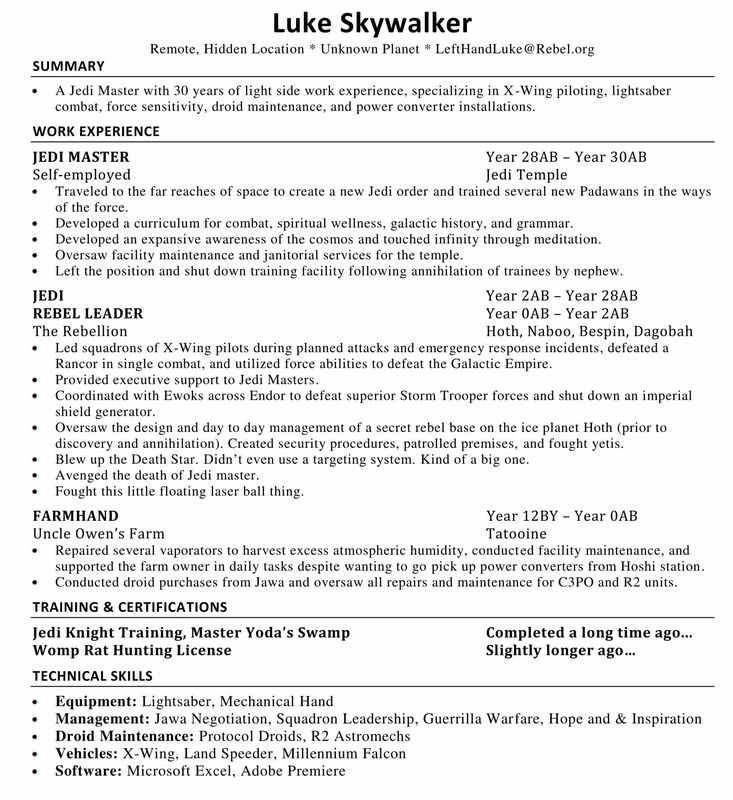 impressive as a Jedi training certification on your resume, you probably want to be a little more exact than “a long time ago…”. Speaking of which, when was the last time you renewed that Womp Rat hunting license and how is it relevant to your current career path? • This is a bit short. Working professionals with senior level experience are generally expected to have enough content to fill a two-page document. This makes Luke’s experience look a bit diminutive, doesn’t it? Don’t be afraid to give your accomplishments the detail they deserve. • How many new Padawans did Luke train exactly? How many X-Wing squadrons was he leading? How many Ewoks was he coordinating with on Endor? If you don’t provide actual numbers or estimates employers are going to assume the lowest possible number. Quantifying your accomplishments whenever possible is one of the most important tactics for writing a compelling, data driven resume, and unfortunately Luke is selling his otherwise impressive accomplishments woefully short. Even adding a monetary figure for how many credits these droid purchases were worth would greatly improve the strength of this document. • Hasn’t Luke been living alone on an island in remote space the past 15 years? Anomalies like that in your employment history will certainly raise eyebrows, to say the least. Gaps happen, especially after major life events. However, it’s your responsibility to demonstrate that you weren’t just sitting on the couch during this time period (which is exactly what the hiring manager will be picturing). Volunteering, freelance work, and even small independent projects are better than a total gap in your work timeline. • This should go without saying, but anytime you get laid off, fired, or fail to succeed at any given position, you shouldn’t outright talk about it on your resume. Discussing the intricacies of your professional history in an interview is one thing, but putting it on your resume is another. Disclosing the fact that you shut down your own Jedi Temple because your nephew destroyed it is probably not a great way to start off your document. • Another problem with this resume is that the bullets don’t provide enough detail and context to make Luke’s achievements stand out. It’s great that you blew up the Death Star and all, but what does that actually mean to potential hiring managers? Luke should be providing the steps and actions he took to defeat this giant space weapon and provide some context for the scale of this massive accomplishment. Employers need these details in order to decide whether or not his qualifications align with the goals of their company. Instead, he’s massively underselling himself, and despite all these achievements, he might have hard time finding a position as an Associate Junk Trader back home on Tatooine.